The Best Wedding Dress blogs from thousands of top Wedding Dress blogs in our index using search and social metrics. We’ve carefully selected these websites because they are actively working to educate, inspire, and empower their readers with frequent updates and high-quality information. 2.10 CocoMelody Mag | Amazing source of wedding inspiration! Wedding Dress newsletter is a comprehensive summary of the day's most important blog posts and news articles from the best Wedding Dress websites on the web, and delivered to your email inbox each morning. To subscribe, simply provide us with your email address. About Blog Maggie Sottero Designs creates extraordinary gowns that turn every bride's vision into stunning reality with innovative and captivating designs. Subscribe to keep up with her romantic ball gowns, chic sheath dresses, form-fitting mermaid gowns and more. Facebook fans 228,201. Twitter followers 11,641. St. Paul, MN About Blog Wedding Shoppe for the stunning designer wedding dresses and bridal party dresses, bridesmaid dresses, junior bridesmaid dresses, flower girl dresses and more. Keep up with the latest wedding trends, planning tips, and designer wedding and bridesmaid dresses. Facebook fans 123,223. Twitter followers 6,858. Australia About Blog Designer wedding dresses by Essense of Australia. Browse our award-winning collection of wedding gowns with exquisite details and romantic finishes. Facebook fans 58,861. Twitter followers 9. Brighton, England About Blog Wedding Dresses, Bridesmaid Dresses by True Bridesmaids & Luna Collections. Find pretty Lace bridal gowns, chiffon bridesmaids and more. Facebook fans 18,522. Twitter followers 1,374. Italy About Blog We design exclusive wedding dresses & gown styles. Wedding dress styles for body types. V-neck, long sleeves, vintage, ball gown. From sophisticated couture gowns to elegant destination dresses, Eddy K's attention to detail flatters all figures and offers styles for any taste or special occasion. Facebook fans 87,281. Twitter followers 6,947. Singapore About Blog La Belle bridal boutique specializing in designer couture gowns, professional wedding photography & personalized concept albums as well as other wedding services. Discover customized couture wedding gowns and ready to wear rentals, choose from a comprehensive range of over 1000 designer couture gowns and suits that reflect your personality. Facebook fans 12,709. Twitter followers 82. Toronto, Ontario About Blog Check out our Lea-Ann Belter Bridal blog featuring real weddings and our stunning brides wearing wedding dresses from our two bridal collections. Make your wedding day memorable with a wedding dress from Lea-Ann Belter. Youll find timeless, modern designs and attention to quality and detail. Facebook fans 3,620. Twitter followers 1,163. United States About Blog DaVinci Bridal is the leading designer of affordable wedding dresses & bridesmaids gowns. This blog is for wedding dress inspirations, bridesmaids ideas, planning tips, fashion advice, beauty tutorials & more exclusive content. Facebook fans 68,513. Twitter followers 12,328. Cincinnati About Blog Bridal and Formal Blog is home to one the largest inventory of bridal gowns, bridesmaids, flower girl & prom dresses! This blog will keep you up to date on all the latest trends in the wedding world. Facebook fans 9,749. Twitter followers 243. 10. CocoMelody Mag | Amazing source of wedding inspiration! Los Angeles, CA About Blog Get interesting ideas for an unforgettable wedding celebration. CocoMelody Magazine - amazing source of inspiration in beautiful bridal gowns, dresses, wedding planning and tips! Facebook fans 373,267. Twitter followers 753. San Francisco, CA About Blog A group for everything, and anything wedding dress affiliated. Albeit designs, ideas, advice, styles, where to purchase etc. Also a great place to post if you are looking to sell, donate, or even in some cases lend your wedding gown. As well as post, if your looking to purchase/receive/borrow a gown. Facebook fans 1,188,536. Twitter followers 547,797. Philadelphia, Pennsylvania About Blog BHLDN provides carefully curated, vintage-inspired attire and decorations for your wedding or special event. They help brides create an event brimming with unusually beautiful garments and objects reflective of their unique personalities. Facebook fans 152,744. Twitter followers 31,695. New York About Blog See the latest wedding dresses and beauty trends for your big day! Check out our best wedding fashion, beauty, and style ideas, from hairstyles to makeup advice to skin-care tips, all on Brides. Facebook fans 2,201,195. Twitter followers 211,061. Canada About Blog Find thousands of images to help you plan your Elegant Wedding! Be inspired by real weddings, style shoots, wedding dresses, wedding decor, and the best local vendors. Facebook fans 19,653. Twitter followers 5,813. Salt Lake City, Utah About Blog Alta Moda Bridal is a couture bridal boutique in Utah with designer wedding dresses from across the globe. Meet our beautiful brides, learn about special events, and new additions for Utah Brides and beyond. From top designer collections to talented up and comers they are all waiting for you. Soft chiffon, structured satin, vintage beading, or something thats, quite simply, different. Facebook fans 3,473. Twitter followers 1,590. New York, NY About Blog Wedding dresses, bridal gowns by kelly Faetanini. The collection offers an elegant, fresh approach on timeless styles with a twist of old world charm while presenting brides with customization options on a variety of gowns. Facebook fans 27,178. Twitter followers 1,054. USA About Blog A new bridal boutique concept specializing in selling overstock designer wedding dresses for way less with locations in Phoenix, Mesa, Los Angeles and Denver. Discount wedding gowns sold off-the-rack in Phoenix, Denver and Las Vegas. Facebook fans 11,533. Twitter followers 379. Cork City in Ireland About Blog Memories Bridal Boutique Cork and Dublin hosts Ireland's largest collection of off the rail wedding dresses, bridal wear and wedding accessories. The Memories blog is full of hints and tips for the bride. Facebook fans 7,770. Twitter followers 118. Hudson, Ohio About Blog Creating the wedding gown of your dreams, one stitch at a time! Bridal blog posts can be endless - but All Brides Beautiful has you covered! Look to our team for amazing wedding designs, style guides and ideas. Facebook fans 3,286. Twitter followers 532. Birmingham, United Kingdom About Blog Bespoke alternative, unusual, vintage inspired and retro silk wedding dresses, custom made bridal gowns in Birmingham, West Midlands. Facebook fans 7,737. Twitter followers 1000. Del Mar, California About Blog A small bridal boutique w/great personal services to help find the perfect gown! The Bustle Bridal Boutique prides itself on providing excellent customer service to brides wanting the ultimate gown finding experience. Facebook fans 4,354. Twitter followers 636. Leawood, KS About Blog Altar Bridal, created for brides that want to shop for fresh and fashionable designer gowns and accessories that define your unique style in a relaxed and personal atmosphere. Facebook fans 3,128. Twitter followers n/a. Salt Lake City, Utah About Blog See lovely dresses and wedding advice galore in our Gateway Bridal Blog. Gateway Bridal & Prom is featuring exquisite strapless to classic modest dresses. We carry Blue by Enzoani, Aire Barcelona, Casablanca, and Jasmine! Facebook fans 2,092. Twitter followers 1. Toronto, Canada About Blog My name is Jule Lee, the founder of White Studio Bridal. Find modern, timeless, classy, effortless wedding dresses and accessories handcrafted in Toronto, Canada. Soak yourself in White. McLean, Virginia About Blog The Bridal Room is new bridal boutique in the heart of the shopping district in McLean, VA. The Bridal Room has a variety of bridal gowns styles that will fit every brides budget and style. Great selections of bridesmaid dresses that will meet every bridal party needs. Facebook fans 768. Twitter followers 233. Strathroy, Ontario About Blog See Once Upon A Time Weddings bridal blog. Serving brides from London, Sarnia, & SW Ontario. Unique wedding dresses & bridal gowns; London, ON. Facebook fans 5,966. Twitter followers 490. Phoenix Metro About Blog Suzanne's Bridal Boutique is all about you! We want your gown buying experience to be hassle free - from I will, to I do! At Suzanne's we don't just sell you the dress and send you on your way. Facebook fans 8,256. Twitter followers 1,252. Homewood, AL About Blog The go-to source for the Alabama bride. From our storefront in Birmingham, AL we feature beautiful photos of wedding dresses, veils, gowns, belts and real wedding details. Facebook fans 2,701. Twitter followers 59. Rockville Centre, New York About Blog A Modern Salon for the Savvy Bride. A stunning new salon in Rockville Centre, NY, inspired by the needs of the sophisticated bride and her bridal party, Blossom Brides prides itself on its exceptional service, industry experience and enthusiastic staff. Offering Bridal Gowns, Bridesmaids Dresses and Special Occasion gowns in a variety of colors and sizes, Blossom Brides is also proud to offer professional alteration and custom design services on any gown, whether purchased from our Salon. Facebook fans 2,465. Twitter followers 23. Singapore About Blog Frieda Brides is a Singapore bridal boutique offers boho vintage, simple and modern wedding dresses with high quality international designers' gowns at accessible prices. Kitchener, Ontario About Blog Get updated with trends, buying tips, designer updates for wedding dresses or wedding planning at First Bridal Boutique Blog. 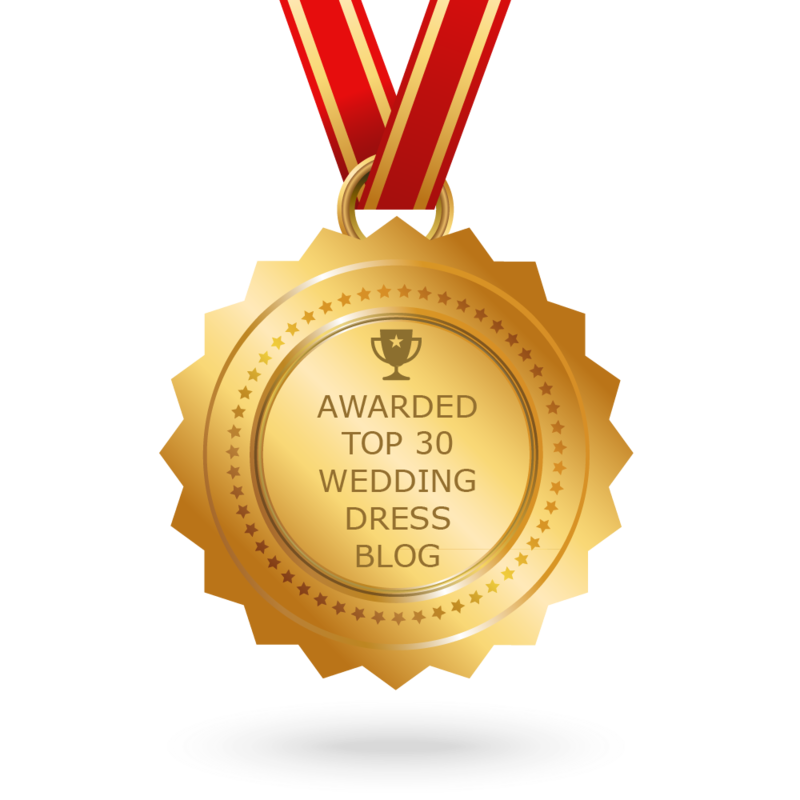 CONGRATULATIONS to every blogger that has made this Top Wedding Dress Blogs list! This is the most comprehensive list of best Wedding Dress blogs on the internet and I’m honoured to have you as part of this! I personally give you a high-five and want to thank you for your contribution to this world.